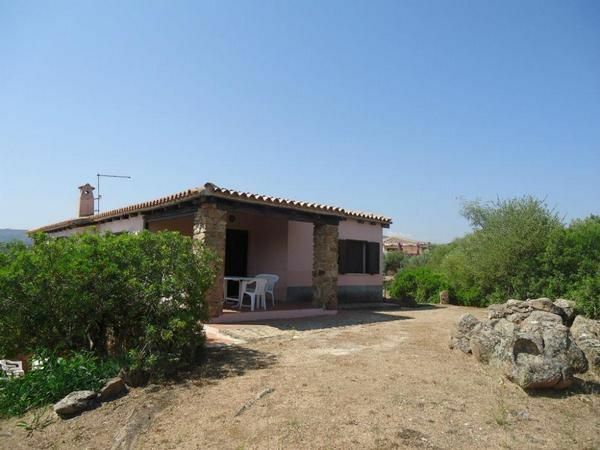 Large family house on two floors near the second beach of Porto Istana. Surrounded by a large private garden, it is on the ground floor living room with sofa bed, kitchen, bedroom and bathroom; Up to the first floor there are two more bedrooms and another bathroom. Present TV and washing machine. For more privacy, each of which is out there, you can also go on with your own entrance. There is also a large outdoor area with table and chairs to eat outside and you can enjoy moments of relaxation; ideal for children with those who want, free and safe as well as for those who can move to spend their holidays surrounded by nature and at the same time just steps from the sea. The beach is 500 meters and therefore within easy walking distance, but for those who want to drive there, you can do it without any problems as the Villa relevance also has a parking 70 meters from the beach. The beach is suitable for children as it gently slopes down, while the main services that are near Murta Maria. The villa is also suitable as a base to visit the beaches on the northeast coast of Sardinia, from Budoni on the Costa Smeralda. For larger groups, it is available next to the other part of the villa, which can comfortably accommodate a further 8 people, for a total of 16 beds. Local tax to be paid on spot: 1.80 euros per person per day for persons over 16 for a maximum of 7 consecutive nights. Internet: costs per object and day in the amount of 9 EUR (optional). Final cleaning: per object and week costs in the amount of 100 EUR (obligatory). Bed linen: to rent per person per week for 10 EUR (optional). Towels: to rent per person per week for 10 EUR (optional). Towels (per property per day, included in the price: EUR 8). Pets (per property per week, the tenant bring 70 EUR).